Sony's recent efforts in the mobile space are beginning to pay off, if we're to judge by the latest statistics from Mobile Today. According to the data, Sony has managed to sell about half a million devices in the UK during the summer, which makes it the second-biggest Android manufacturer by volume after Samsung. Previously, it was HTC that was second, but it has only managed to sell about 440,000 units this summer, so it's now down to third place. Samsung remains firmly at the top with 3.2 million units sold during the same period. The UK is an important market so that's a pretty neat win for Sony. We guess the Japanese manufacturer managed to climb up due to a more diverse portfolio or products and faster OS updates, which is very important if you're to compete successfully on the Android market nowadays. very very true. sony fans always talking about xperia design.. feels good not cheap.. blah blah..
are you saying it isnt good? so is what she stated, what about the loyal fans that would buy an xperia phone regardless of what it looks like?? yes design is a major selling point but not the "only" reason why people buy a phone Look its wendy were talking about here do i need to explain any further? :( the only reason why im responding to her is because people seem to believe what she just wrote.....and that would be a lie to say it is because of design only that people bought an xperia phone when you have people that like the Sony brand alone, they also like the exclusive walkman music app it brings, and it being a playstation certified phone makes it even more desirable! They still need to leap frog samsung's hardware (processors) to do just that. Also they need to focus more on future rival devices rather that competing against the SGS3 & iPhone5 when they made the Odin/Yuga. Sony currently concentrate their efforts on Android (to develop feature rich customized versions of Android I guess). Sony is very strong in cameras, screens and games too. Sony brand is one of the biggest and I believe Sony will be very successful next year. SS will still be on top but I think Sony will move very close to them. HTC makes nice phones but they do not have muscles to compete with the best. HTC has very little resources: ecosystem, capital, manufacturing arms, software development... Sony has almost everything, they lacked focus that's why their position dropped so low, but once they regain the focus... SS watch out!! Sony needs to release their flagship on time. they have yet to release a quad core phone even Lenovo has one now. Because sony phones are affordable and well designed. Sony will Regain Again to the Top of all the Manufacturers ! .. Sony was Busy doing their other businesses because now they more Focus on Sony Xperia Lines , Sony Vaio Laptops and the Sony BRAVIA LED Tv 's . Sony will Rule the World of Electronics and Gadgets Again ! 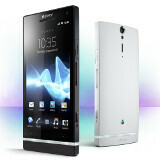 Congrats, Xperia design are beautiful... Maybe next time will be the time to get a Sony device.